An old fashioned summertime picnic with homemade pie. It’s the best All American experience you can have on Independence Day weekend! Last year we had over 30 pies. 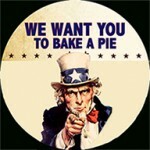 So bake a pie and come join us (pie bakers get in free!). There will be prizes! See events for details. You are currently browsing the Bedford Winery blog archives for June, 2016.